A brand new style of condiment caddy that we just imported from a specialty shop in Bangkok. 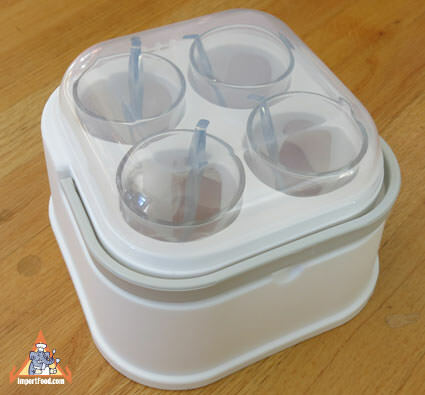 Under the lid is a set of four, high quality (relatively thick) glasses with a spoon in each glass. The capacity of each glass is 3/4 cup. The plastic base is 7.5" wide, and the set is 7" tall with the lid extended up. The convenient handle swings up. 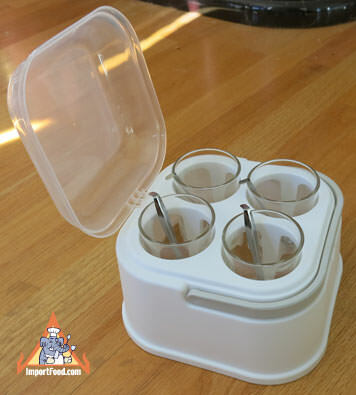 Comes in a full color box with suggested use as a caddy for Thai condiments or various spices, jams, etc, for use around the world. In Thailand the first two condiments below (Nam pla prik and Prik dong) are likely be on every household's table together with a separate small dish of plain white sugar and a separate small dish of ground chili powder. Spoonfulls of each are added to suit individual taste. We suggest you make a portion of Nam pla prik and Prik dong and keep in a jar (non refrigerated) for serving as a condiment in this manner. These condiments keep very well. Prik Si-iew wan, kratiem dong and Khing Ki mao are less common and usually served for particular dishes. 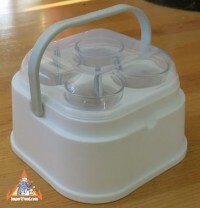 Our Thai Condiment Caddy is a nice way to serve these.